I was surprised as anyone. Not at the decision, but the announcement. 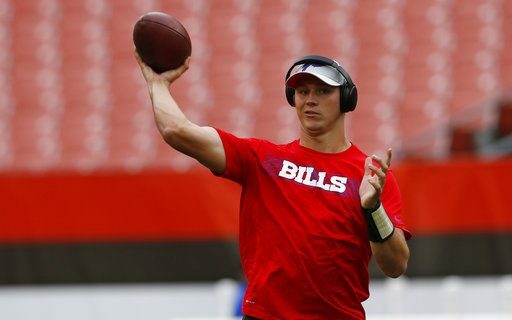 After hiding his choices for starting quarterback for the first two preseason games, Sean McDermott announced Monday evening that Josh Allen will start Sunday against the Bengals. It was the choice that was obvious, and the one that most Bills fans wanted to see. But by announcing it now, McDermott has laid the groundwork for this to be the same decision for Week 1 vs. the Ravens. The third preseason game is always the most extensive dress rehearsal. There isn’t enough time to experiment. The guy who starts this game will use it gain continuity with the receivers and comfort with the offensive line. A coach wouldn’t waste that to just see how a guy does with the starters. I believe this is where it’s going for Allen and the Bills. If he struggles under the pressure, the team could always go back to Nathan Peterman or the now healthy A.J. McCarron. But that doesn’t seem likely. So what has Allen done to be on the brink of starting the season under center? Let’s examine. All the knocks on Allen coming out of college have been addressed in various degrees. His accuracy, statistically, is still below 60%. But he has throw the ball well, and given his receivers a chance to make plays. Most of that comes from his footwork. That was a big red flag at Wyoming. Footwork leads to accuracy. It’s clear that Allen has worked hard on his feet. QB guru Jordan Palmer started that before the draft. The Bills coaches have reinforced it since he arrived in Buffalo. It makes you think that we all have to avoid getting too locked in what we see from a player in college. Allen, thanks to all that offseason work, has fixed his major flaws in just eight months. Another knock on Allen was his lack of “big time” games versus “big time” opponents. At Wyoming, he didn’t play the top teams. When he did play Power 5 opponents, he struggled. That hasn’t happened here. He does not seem to be intimidated by the NFL. He has appeared calm in games, and the league does not seem too big for him. That contradicts another of the scouting criticisms of Allen. He never really played with a lot of NFL-caliber teammates at Wyoming. Now that he’s actually on an NFL team, he has risen to that level. Maybe the lack of talent at Wyoming was holding him back, not the other way around. While Peterman and McCarron have played fine, they haven’t played well enough to take control of the job. As I wrote last week, the lack of a clear favorite coming out of training camp was a big problem for me. Neither guy was consistent enough to stay with the starters, which is why McDermott kept changing the order in games and practices. If the Bills intention was to have Allen sit, that would really only be based on making sure one of the others played well enough to hold the spot. That didn’t happen. Let’s be honest. Allen was going to start at some point this season. That’s why the Bills took him #7 overall. So there was always going to be an unsaid or hinted at notion that the team knows he is the best guy. Yes, they may have wanted him to wait. But now, as seen with guys like Wentz & Mariota, the rookies play early. That’ s why they were taken, because they have the best skills at the position. First round picks play quickly, no matter what. It didn’t used to be that way at QB. It is now. Brandon Beane said this at the Draft. If the entire team knows Allen is the best guy, he has to play. Regardless of a desire to bring him slowly, if he’s the best QB then he plays. Same as a receiver, linebacker or cornerback. The coach owes that to his team. I think it’s clear to me that Allen has been the best quarterback so far. That’s his arm, his legs, his leadership and his poise. Everything. If it’s obvious to me, it’s really obvious to the players and coaches. Will He Start The Season Opener? Sure, there is a chance that if Peterman lights it up again in the final two preseason games, he could get the nod. But to me, that will only be because a decision was made to let Allen soak in the regular season and not feel the pressure of an opening-day starter. But this move wouldn’t have been made if that wasn’t part of the plan. While it’s not official yet, I would expect to see #17 roll out for the first play in Baltimore on September 9.